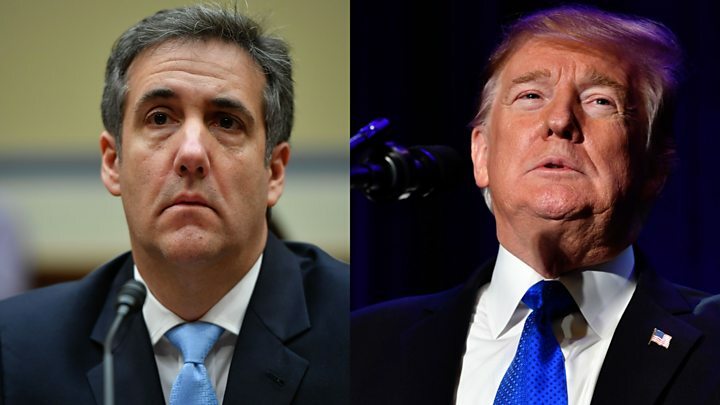 US President Donald Trump has rubbished his former attorney Michael Cohen's damning testimony to Congress, but said he was impressed by one part of it. "He didn't lie about one thing, he said 'no collusion,'" Mr Trump said. The US president criticised the timing of Wednesday's "fake hearing" on Capitol Hill. Cohen said he had no evidence that Mr Trump colluded with an alleged Russian plot to influence the 2016 election, though he had his suspicions. Possible collusion is being investigated by a justice department inquiry that is in its closing stages and has dogged the president during his two years in office. Mr Trump has repeatedly denied the allegation, as has Moscow. 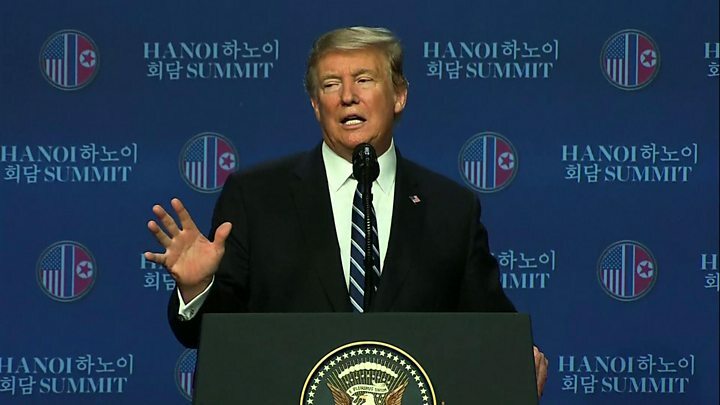 Speaking at a news conference in Vietnam on Thursday after his summit with North Korea's Kim Jong-un ended without agreement, the US president said it was "sort of incredible" that such a hearing would be held back in Washington while he was on an important overseas trip. He told reporters: "I tried to watch as much as I could, I wasn't able to watch too much because I've been a little but busy. "I think having a fake hearing like that and having it in the middle of this very important summit is really a terrible thing. "They could've made it two days later or next week." 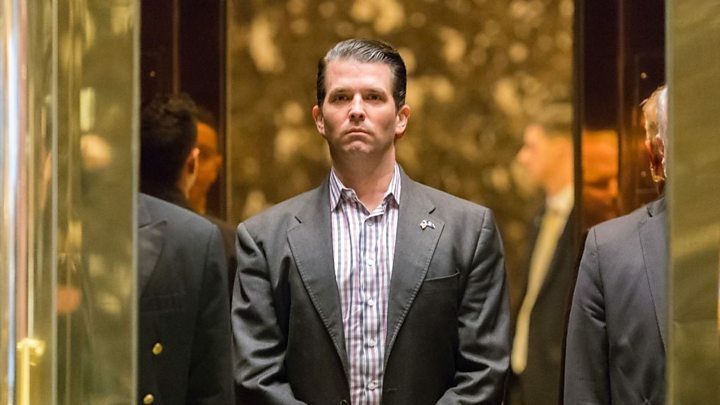 Media captionMichael Cohen: Trump told me "Don Jr had worst judgement in world"
Mr Trump said Wednesday's testimony by his former lawyer before a House of Representatives committee that Mr Trump was a racist and conman was "incorrect". "He lied a lot," Mr Trump said. "But it was very interesting because he didn't lie about one thing. He said 'no collusion' with the Russian hoax. "And he lied about so many different things and I was actually impressed that he didn't say: 'Well, I think there was collusion for this reason or that.'" Cohen told lawmakers Mr Trump had directed him to lie about the payment of hush money to women, and about negotiations for a Moscow property deal during the 2016 White House election campaign. He also said Mr Trump had disparaged black people and had prior knowledge of an emails leak that damaged Hillary Clinton during the presidential race. Committee Republicans savaged Cohen, noting he has already pleaded guilty to lying to Congress and is facing a custodial sentence. On Thursday, two of the president's congressional allies asked the Department of Justice to launch a criminal investigation into Cohen's answers. Republican lawmakers Mark Meadows and Jim Jordan said the witness had committed perjury several times including when he said that he had never sought a job at the White House. On Thursday he testified behind closed doors to the House intelligence committee. What might 'Mueller report' look like?